Mobile Fidelity Bob Dylan reissues - Winner of a Gruvy Award, chosen by AnalogPlanet's editor, Michael Fremer, for vinyl records that are musically and sonically outstanding and are also well mastered and pressed. Mo-Fi's stereo Dylan reissues are models of transparency, detail, clarity and warm musicality. The early ones are from analog re-mixes of the 4 track masters that sound better than the originals in my opinion. Ten songs that ultimately changed the world. Ten songs pulled from precedent-establishing albums recorded between 1963 and 1966. More than five-million copies sold. In every way, Bob Dylan's Greatest Hits is a fundamental collection for every music lover, and the perfect choice for those seeking an introduction into the legend's vast career. For this is a collection so prized, even the photo won a Grammy. Greatest-hits volumes are often hit-and-miss propositions not because of what they contain, but because of what’s missing. Filtering the top selections from the six formative, life-altering albums Dylan made between 1963 and 1966 is an arbitrary process but one performed impeccably on this set. 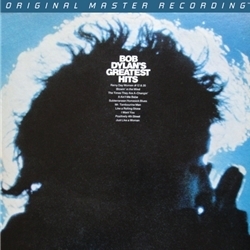 Home to his biggest chart successes as well as his most influential songs,Bob Dylan’s Greatest Hits is a veritable template for any aspiring singer-songwriter, an American history lesson, and a seminal release for anyone new to his work—as well as for audiences that find some of his deeper cuts an acquired taste.